It's the last day of the academic year, and the students of a small, mid-western university are preparing for a bacchanalian celebration called Crazy Night. Our chaperone for the evening is Phil, a freshman on the verge of flunking out, who roves the fraternities in search of beer, women, and the meaning of life. It's just after the Great Crash, with Prohibition in sobering effect-a bleak time for college graduates and drop-outs, who have one more night to do everything, before they enter a world that offers them nothing. 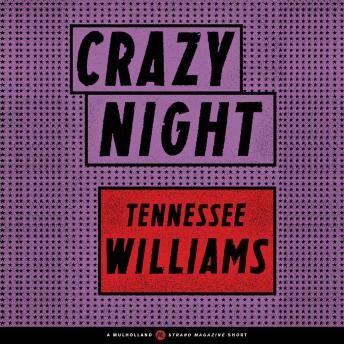 "Crazy Night" by Tennessee Williams is one of 20 short stories within Mulholland Books's Strand Originals series, featuring thrilling stories by the most legendary authors in the Strand Magazine archives. View the full series list at mulhollandbooks.com and read them all!